Area dmg is not usless it's now been fixed. Look it up. I watched the video.. I honestly still cannot work out how to make my items better by changing numbers or is that just a guide to help find things you make the said item better? Should i reroll STR to CHD or AD to CHD? Area damage is NOT fixed yet, and only works in few cases. Yeah get rid of AD gear for HOTA. AS to CD for sure. Ahoy! 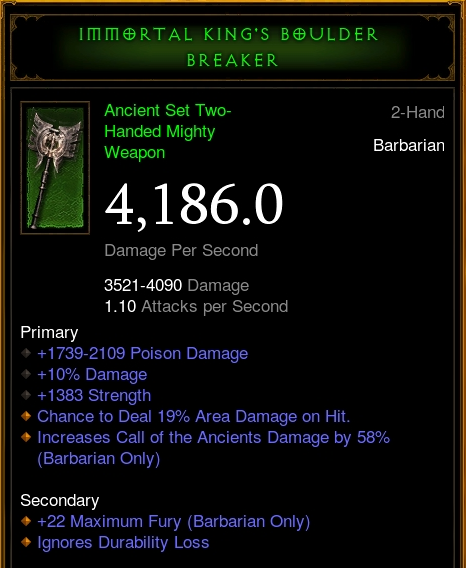 Just got this one, and looking to reroll it. I'm playing Season HC, so I'm a bit more defensively geared than in SC since I'm not pushing super hard for ranks. I'm guessing it's the CDR that will be rerolled, but shall I go for 10% CDR or for Vitality since I'm HC? I guess CDR is the way to go, but I just want to get a second opinion. ^ I'm jealous of the previous BK Solemn Vow! 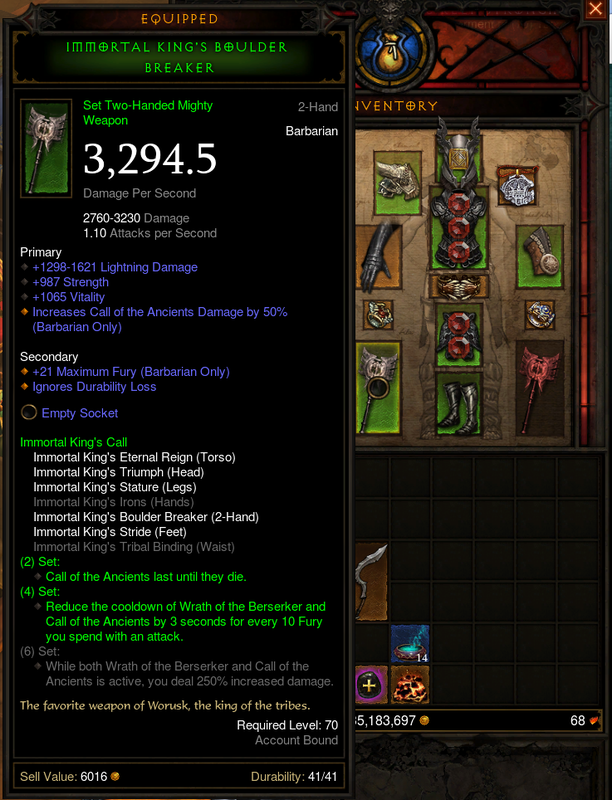 Here's the one I got, and am looking for reroll advice. I'm playing SC Seasonal. I don't have any Ramalamadingdong's Gifts in seasonal yet, which I would imagine simply means reroll the Life per Hit to a socket. However, if I was to get a gift reasonably soon, would it be worth rerolling the base dmg to higher and then using the gift on it, or should I just hold out for a better one to use a gift on and reroll the LpH? 1. 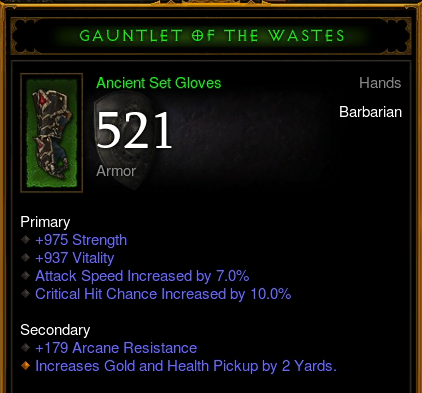 How should I reroll the gloves? Since crit isn't that important for me anymore, I was thinking of either rolling higher vitality or even go for a secondary resistance. 2. Should I look for a better gavel from the cube? I still miss some ancient armor pieces, so I won't gamble weapons yet. 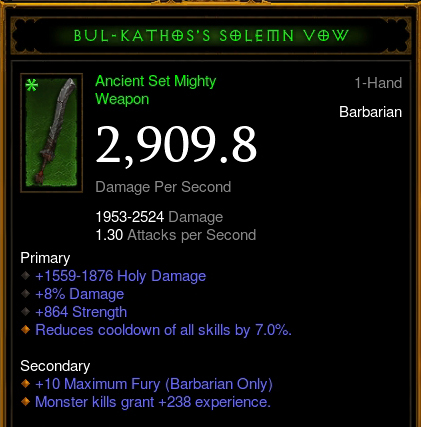 What do I reroll on this? I already used a Gift for the socket. I'm a Rend 6IK 2 Waste build. 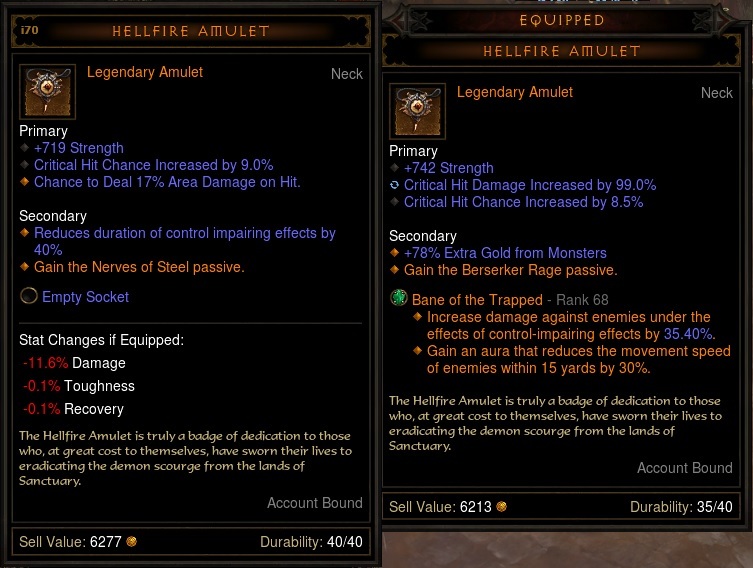 I was thinking reroll the IAS to 10% damage but I'm not sure. What should i roll on this ? 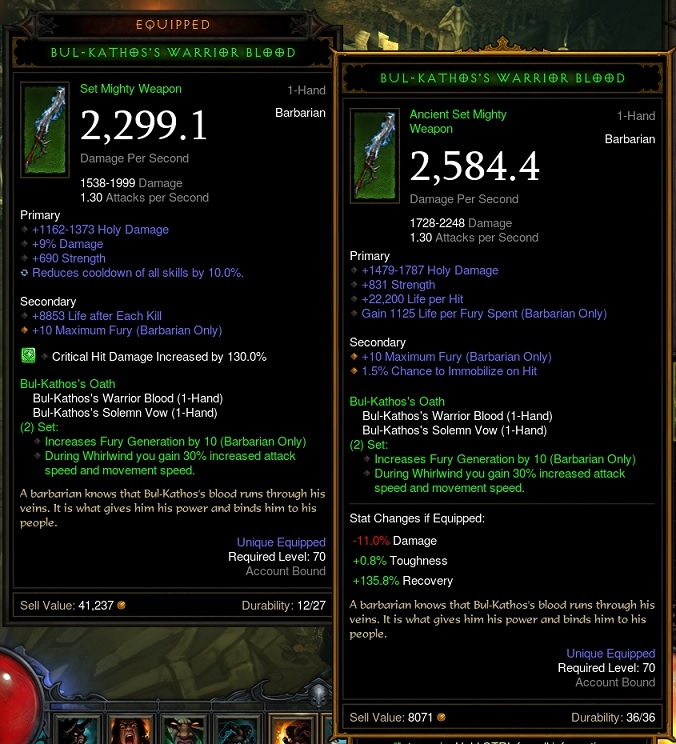 Kinda Lost here, what should i reroll ? 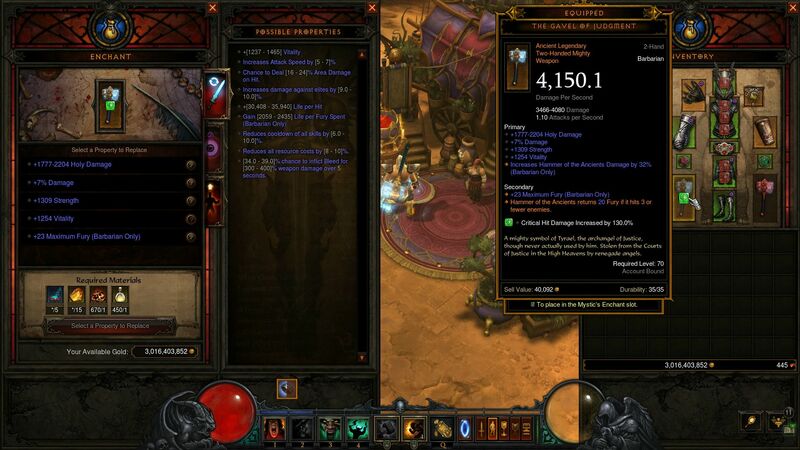 Dont know what to roll on this ancient leg, do I roll vit to max or extra gold to physical res ? *update: checked it there is no physical or any type of res, guss will max the vit or if there is another state i should look for ? was thinking vit to attack speed? thoughts?